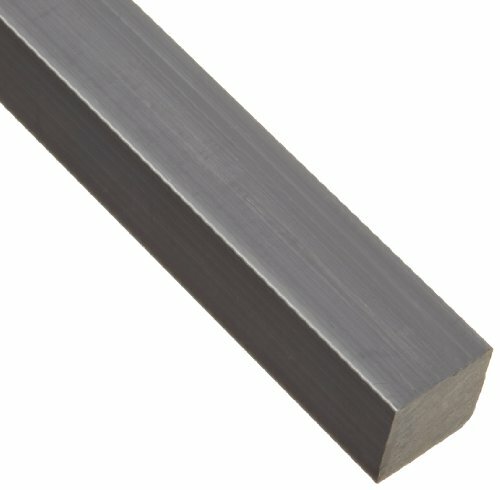 The opaque gray PVC rectangular bar has a standard tolerance. PVC (polyvinyl chloride), also known as vinyl, is a durable plastic that provides an excellent balance of strength and weight, and is typically resistant to acids, alkalis, and most other inorganic chemicals. The material is also dimensionally stable, due in part to its low moisture absorption. Tensile strength, used to indicate the material s overall strength, is the peak stress it can withstand before it breaks. Corrosion resistance describes the material's ability to prevent deterioration caused by atmosphere, moisture, or other medium. Wear resistance indicates the ability to prevent surface damage caused by contact with other surfaces. Toughness describes the material's ability to absorb energy before breaking, while hardness (commonly measured as indentation hardness) describes its resistance to permanent surface deformation. Impact resistance is the measure of a material s ability to absorb a shock of energy before breaking. 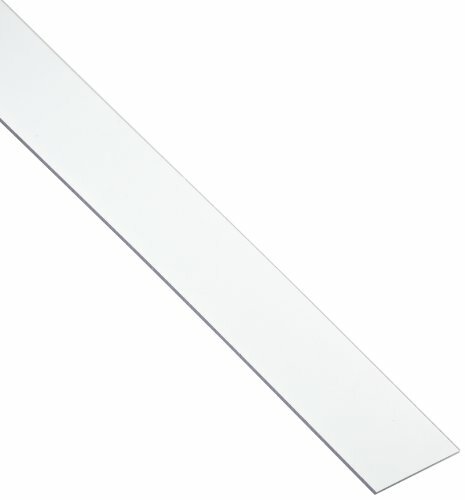 The opaque white UHMW rectangular bar has a standard tolerance. UHMW (ultra high molecular weight) polyethylene is an impact-, chemical-, and moisture-resistant plastic that has excellent abrasion resistance and a low-friction surface. UHMW is more rigid than LDPE and HDPE, and has better abrasion resistance than PTFE. 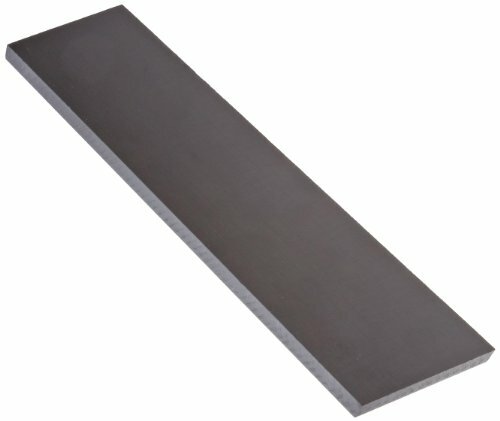 The opaque gray PVC rectangular bar has a standard tolerance and meets Underwriters Laboratories UL 94 and American Society for Testing and Materials ASTM D1784 specifications. PVC (polyvinyl chloride), also known as vinyl, is a durable plastic that provides an excellent balance of strength and weight, and is typically resistant to acids, alkalis, and most other inorganic chemicals. The material is also dimensionally stable, due in part to its low moisture absorption. 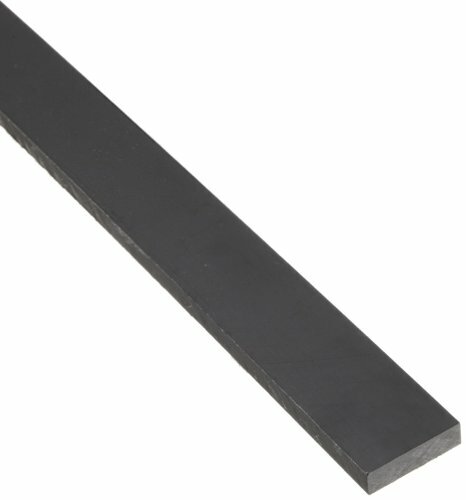 The opaque black acetal copolymer rectangular bar has a standard tolerance and meets American Society for Testing and Materials ASTM D6100 specifications. Acetal copolymer is a strong, rigid plastic that offers excellent dimensional stability, enhanced by the material's moisture and creep resistance, and maintains its properties better than acetal homopolymer when exposed to hot water, hot air, and humid environments. The material has a low-friction surface and excellent abrasion resistance. 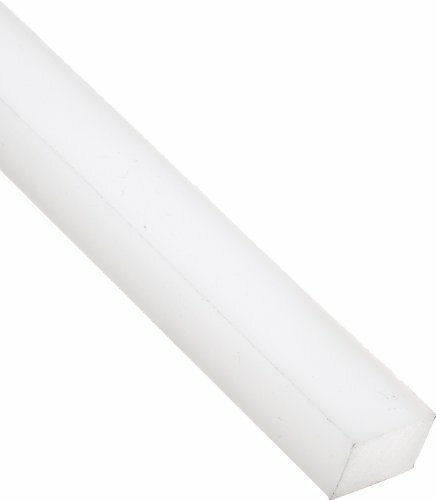 The opaque white PTFE (Teflon) sheet has a standard tolerance. PTFE (Teflon) (polytetrafluoroethylene) resists most chemicals, typically withstands high temperatures, and has a low-friction surface that does not bond readily with other materials, giving it a nonstick characteristic. This material shares many of the same properties as other fluoropolymers, but generally withstands higher temperatures than FEP and ETFE. Plastic refers to a group of synthetic or semi-synthetic materials that have been engineered to achieve specific properties. The most notable characteristics of plastics are its low weight, machinability, corrosion resistance, and typically good thermal and electrical insulating properties. Certain plastic grades also offer optical transparency similar to glass, low-friction or self-lubricating surfaces, and exceptional impact resistance. Depending on their properties, certain plastic grades can be used as alternatives to metal, glass, and ceramic. Unlike metal, plastic may experience creep, which is deformation caused by longtime exposure to a constant load. Tensile strength, used to indicate the material's overall strength, is the peak stress it can withstand before it breaks. Corrosion resistance describes the material's ability to prevent deterioration caused by atmosphere, moisture, or other medium. Wear resistance indicates the ability to prevent surface damage caused by contact with other surfaces. 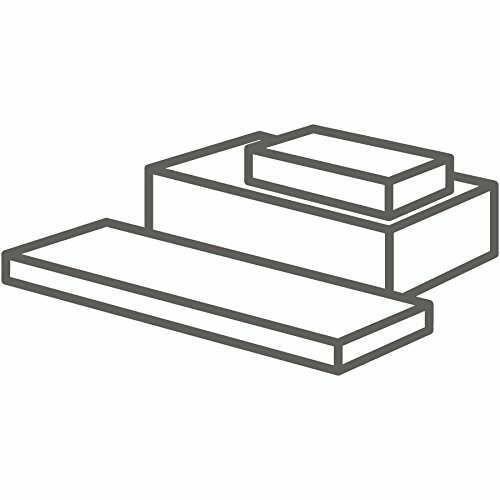 Toughness describes the material's ability to absorb energy before breaking, while hardness (commonly measured as indentation hardness) describes its resistance to permanent surface deformation. Impact resistance is the measure of a material's ability to absorb a shock of energy before breaking. 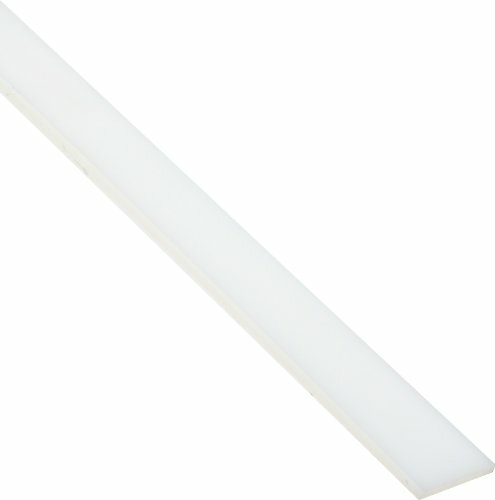 The opaque white acetal copolymer rectangular bar has a standard tolerance and meets American Society for Testing and Materials ASTM D6100 specifications. Acetal copolymer is a strong, rigid plastic that offers excellent dimensional stability, enhanced by the material's moisture and creep resistance, and maintains its properties better than acetal homopolymer when exposed to hot water, hot air, and humid environments. The material has a low-friction surface and excellent abrasion resistance. The opaque black nylon 6/6 rectangular bar has a standard tolerance and meets Underwriters Laboratories UL 94V2 specifications. Nylon 6/6, the most widely used nylon type, offers excellent wear and abrasion resistance and a low-friction surface, while providing greater strength than nylon 6/12 and absorbing moisture more slowly than nylon 6. This material has good chemical resistance and allows very little gas to pass through it, also known as gas permeability. 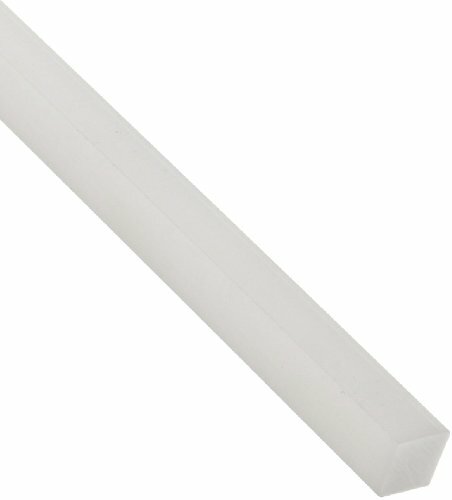 The opaque off-white nylon 6/6 rectangular bar has a standard tolerance and meets American Society for Testing and Materials ASTM D5989 specifications. Nylon 6/6, the most widely used nylon type, offers excellent wear and abrasion resistance and a low-friction surface, while providing greater strength than nylon 6/12 and absorbing moisture more slowly than nylon 6. This material has good chemical resistance and allows very little gas to pass through it, also known as gas permeability. 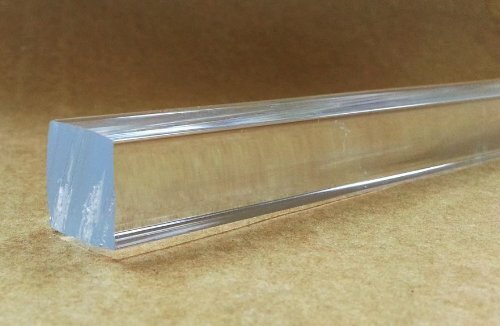 Acrylic Rectangular Bar (Extruded) - Clear - 72" x 3/4" x 1"
Acrylic/Plexiglass rods are durable, scratch-resistant, and tougher than glass; making them a perfect fit for any number of projects! Available in a range of shapes and sizes, they come in lengths of 6 feet. If you need yours cut to size, please contact us.